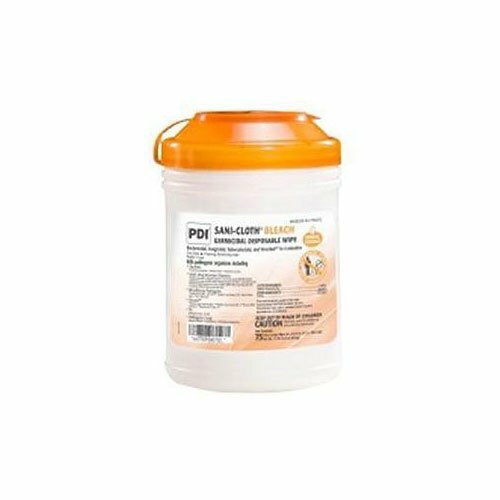 Sani-Cloth Bleach Germicidal Disposable Extra Large Wipes is an ideal product choice when needing to thoroughly and quickly clean areas that have been exposed to a wide range of micro-organisms. This product is highly effective, easy to use, and come in handy canisters or individually wrapped packets. Sani-Cloth Bleach Wipes are compatible with a broad range of surfaces and equipment in healthcare. It cleans and disinfects in one easy step and is ideal for disinfecting high risk areas endemic with Clostridium difficile spores and Norovirus. Sani-Cloth is effective against 50 microorganisms in 4 minutes. Contains 40 individually wrapped Sani-Cloth Bleach Germicidal Disposable Wipes - X-Large.